Fantastic news! In line with this year’s #24otvx theme of “pay it forward”, we have discovered that our mere 50 Tweets for #OTalk this week have reached more than 4000 people! Check out our Tweetreach report. We hope you’ll agree this is a great start to the project- so how many can we reach for week two?! “Enabling people to engage in meaningful daily life occupations, contributing to health and wellbeing”. “To work with the patient to enable them to develop activities they want and need to do”. “Helping People to do the activities they want to do everyday from getting up to work and hobbies often using those activities to work on the skills they need to develop. Exact working often changes”. “Useful to talk about performance areas, not just self-care etc”. “Enabling engagement in occupation although interestingly often back this up by explaining occupation as meaningful activity”. This triggered many discussions around the challenges of defining what we do. It was acknowledged that occupation has a myriad of definitions, often requires clarification and explanation and that this can be part of the challenge when describing what we do. It was suggested however that other terms such as activity and function do not capture what occupation is and occupation was acknowledged as complex and fascinating. There was discussion around how occupational therapy should focus on making a difference rather than defining occupation and it was acknowledged, rather appropriately that actions speak louder than words. Discussion around a diversity of identity across the profession was interesting, with participants acknowledging that occupational therapy roles vary across different fields. This led to much discussion around the impact conforming to service needs can have on occupational therapy practice. There was acknowledged pressure on OTs to conform to the needs of the service as opposed to the client, often accepting generic tasks that can result in denting our identity. Participants discussed why OT’s use non-occupational therapies and many felt that this is often due to the fact that they can be justified as having an impact on function. However, it was acknowledged that just about everything can be explained in terms of meeting an occupational need and it was suggested that we need to distinguish between what we do best and when needs can be better met elsewhere. Participants also discussed how we communicate our identity and some felt that an increase in OT evidence and research would help other professionals and the general public to understand more about OT identity and role. However it was questioned if these groups would read OT journals. Open access publishing , TV adverts, blogs and wikis were discussed as ways of communicating what we do to MDT’s, the public and policy makers. Also discussed was the role of OT education in fostering professional identity. While it was argued that students expect skills based training, addressing professional identity, particularly as training is not specialized was considered important. Throughout the discussion participants shared strategies they used to maintain an occupation focus, in-line with their professional identity. Participants talked about basing practice on conceptual models and occupational science. Also discussed was the value of MDT’s using the same model, using occupational words when communicating with other professionals and defining goals occupationally. … what a fantastic set of #OTalk and #Occhats! … Kudos to the OT4OT Team– a great example of global collaboration between OTs who have provided a range of fantastic CPD resources, including a Facebook Group. This is the second #24OTvx, after great success last year with the first. … if you do attend a session, please fill out this evaluation form so the team can continue to hone the event to meet our needs as OTs for high quality, relevant CPD opportunities. … all talks are open access, all will be available through the website after the presentation. A truly magnificent achievement, and very appreciated by their huge audience, I’m sure. … there’s still time to catch several talks- they go on until 6pm tonight (Thursday 27th) and you can check out the Schedule here. … personal highlight so far (Claire) is the Laughter presentation by Alice Hortop, which actually made me LOL! lowlight (Claire) huge tummy butterflies anticipating my 12 midday presentation today. … the world of OT seems to be so exciting at the moment- what has sparked your interest recently? We hope you’ll find our blog interesting- we hope to have a range of different contributors to this group blog, in order to show the range of practice of Occupational Therapy, and the huge application of Occupational Science. 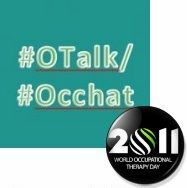 We have a Twitter feed, a Facebook page, and we host a weekly Tweetchat alternating between OT (#OTalk) and OccSci (#Occhat), on Tuesdays at 8pm (UK time). Our first chat was on October 25th 2011, watch out for the blog post to follow and link to transcript. Please, feel free to get involved through these Social Media resources- leave a comment on the blog, follow us on Twitter, join our Facebook page. Together we can learn more about the fascinating world of OT and Occ Sci!